Astronomers find a ‘Zombie’ star that lived and died – twice | Watts Up With That? This is an artist’s impression of a supernova explosion. CREDIT Courtesy of the European Southern Observatory/M. Kornmesser. Pasadena, CA– It’s the celestial equivalent of a horror movie villain–a star that wouldn’t stay dead. An international team of astronomers including Carnegie’s Nick Konidaris and Benjamin Shappee discovered a star that exploded multiple times over a period of 50 years. The finding, published by Nature, completely confounds existing knowledge of a star’s end of life, and Konidaris’ instrument-construction played a crucial role in analyzing the phenomenon. In September 2014, the intermediate Palomar Transient Factory team of astronomers detected a new explosion in the sky, iPTF14hls. The light given off by the event was analyzed in order to understand the speed and chemical composition of the material ejected in the explosion. This analysis indicated that the explosion was what’s called a type II-P supernova, and everything about the discovery seemed normal. Until, that is, a few months later when the supernova started getting brighter again. Type II-P supernovae usually remain bright for about 100 days. But iPTF14hls remained bright for more than 600! What’s more, archival data revealed a 1954 explosion in the exact same location. An image taken by the Palomar Observatory Sky Survey reveals a possible explosion in the year 1954 at the location of iPTF14hls (left), not seen in a later image taken in 1993 (right). 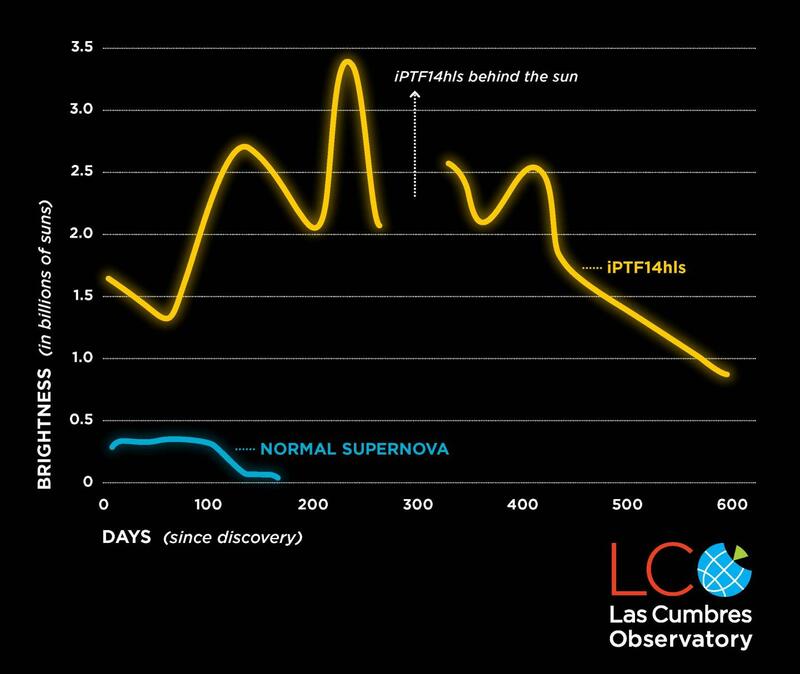 Supernovae are known to explode only once, shine for a few months and then fade, but iPTF14hls experienced at least two explosions, 60 years apart. It turned out that somehow this star exploded more than half a century ago, survived, and exploded again in 2014.
iPTF14hls grew bright and dim again at least five times over two years. This behavior has never been seen in previous supernovae, which typically remain bright for approximately 100 days and then fade. CREDIT Adapted from Arcavi et al. 2017, Nature. Credit: LCO/S. Wilkinson. …said lead author Iair Arcavi of University of California Santa Barbara and Las Cumbres Observatory. An instrument built by Konidaris was key to analyzing the light emitted by iPTF14hls, which dimmed and brightened at least five times over three years. Called the SED Machine, Konidaris’ tool is able to rapidly classify supernovae and other short-lived astronomical events. A quick turnaround on classifying these kinds of so-called transient objects in the sky was sorely needed when Konidaris and former colleagues at Caltech first built the machine. Stellar explosions teach astronomers a great deal about the origins of much of the material that makes up our universe. A supernova explosion may even have triggered the formation of our own Solar System. “Nick’s role in this discovery demonstrates the importance of having an active instrumentation effort, which is increasingly rare on many campuses,” added Observatories Director John Mulchaey. November 9, 2017 in Astronomy. It certainly throws an interesting twist into all this scientific certainty the ideologues have stamped with Peer Review certification. Makes one wonder if, until this observation was made whether they had a 97% consensus that this couldn’t happen. I would guess that in anyone challenged them they would label them deniers by the Peer Review process. At that distance, can they be sure it was the same star? Or just one the same place within the resolution of the instruments, which should be considerable, as it happened in another galaxy. They’re pointing to a whole section of a galaxy and claiming it’s the same star. Once again, researchers demonstrate lifting a gross assumption to the level of established theory and assumed real. Presumably, they at least matched radiation signatures before tagging it as the same one. Still possible, but less probable, that there are different stars flashing at us. Shur nuff is the same star, ……. as well as the same explosion(s). Apparently what they fail to realize is that there is a big “ball” of extra dense Dark Matter that is orbiting out there somewhere between that star and the earth and it noninfrequently blocks any earthling’s view of said star. Just a rip in the space time continuum, nbd. Just another nail in the coffin of the standard model, except that they’ll tweak their parameters to fit their new elephant and they’ll carry on as though nothing is wrong. Yep. Climatology isn’t the only branch of Science that has a serious problem. In this case, a large object or objects closing orbiting the supernova may account for the dips – it is occluding light. The best explanation would be the remains of a sister star, likely now a dark star (brown or black). Their measurement (and expectation) for the mass of the exploding star is likely way off. If I remember right, a smaller star will evolve more slowly. Also, there could be more than one supernova – it’s just possible. Sister stars of the same approximate age and size would evolve at the same rate. One exploding could in theory cause the others that are near their own deaths to collapse. This would lead to multiple peaks. If the stars are very close together then we can’t tell them apart at such distances. Such groupings of sister stars does occur in our own galaxy, the results of a very heavy star nursery. Lastly, the “models” may simply be wrong about the collapse of a star. Just because we think we have good understanding of something doesn’t mean that nature cooperates. 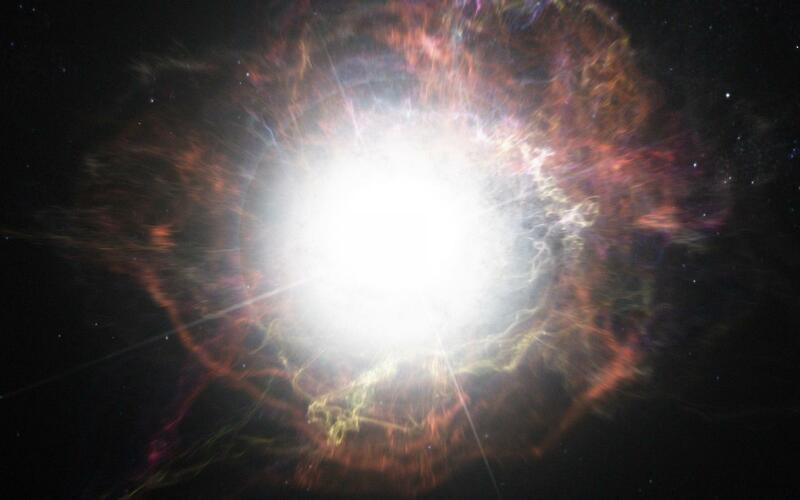 It is possible that under certain conditions running out of one fuel and partially collapsing to start running on a less efficient fuel results in a supernova like outburst. There are several different fuels before you poison the nucleus with enough iron and nickel to completely collapse the star. blame CO2 ! Greenhouse effect ignited the star a second time ! Thanks. This event is indeed puzzling & unusual, if it is the same star…. Good one Ric, this was my initial thought. We used to have a regular commentator on this site, ex NASA Scientist, Oliver K Manuel, who thought that the Sun had been born twice, or was the remnants of an earlier exploded star. He no longer seems to comment here, I do not know whether this is because he has been banned, or whether there is some other reason. People thought that idea was wacky, but, given this recent observation, perhaps the idea is not as wacky as it first sounds. The wackiness is the belief that the sun was formed around the core left over from the previous super nova. MW, agree. By the definition of a supernova, there is nothing left to fuse innthe core of a supernova. Or, it would not have supernovaed. Why is that so wacky ?. So, yes, it is wacky. 1954 might be a bit suspect as the same star. But supernove are not supposed to last 600days, nor pulsate. So theory needs revision in light of new observations. Well done, astronomers. If I could say something weird, will be in the lines of a “prediction” or a “projection”…… when contemplating supernovas the weirdest and most “disturbing” will be not the zombie ones, but the the proper Dark supernovas. Lets wait and see….what luck or weird chance may brink forward. There always has to be a first time. A star that is right at the Supernova limit in terms of initial size and composition will have an unstable ending. Betelgeuse is a good example as it is just over the limit and has experienced flare-ups in the last 200 years. It is the Chuck Norris star. – First telescopes pointed toward night sky – Ptolemaic ideas threatened and then overturned after enough study time to discount old paradigm. – Multiple CMB satellites show an unexpected smoothness to the background but anistropy supports Big Bang with Early Inflation. – First careful survey of atmospheric CO2 in a pristine location – steadily increasing CO2, study still ongoing. – First measurements of Antarctic ozone in stratosphere – OMG!! a seasonal hole appears in the data. Surely this has never happened before we had this measuring system. Panic ensues. CFCs banned. Holes shrinks, CFCs remain high. Hmm, observations continue. – Neutrino detectors – 3 flavors suggest they have mass. anti-neutrinos and neutrino oscillations differences hint at CP violations,which would explain preponderance of matter over anti-matter. – LIGO interferometers operational. GWs detected!! Maybe at a rate higher than expected. Time will tell. – OCO-2 watching Earth and slowly gathering data on CO2 sources and sinks. First surprise: Tropical forests are sources not sinks. Still the paradigm of man’s CO2 as dominant source continues unabated today. Time will tell, but it is not on the Alarmist’s side. So… Once more cosmology is ‘surprised’ by something out there? How many more surprises are needed before they admit there is something wrong with their basic theory? Actually, you just have to love the simple-mindedness of science reporters. I mean these guys are usually just Bachelor of Arts in Journalism majors, who may have taken a college survey course or two in a science field. Now the chuckle is that we are seeing it through a millimeter wave-length antenna (they call it a telescope, but its a big-assed dish antenna as anyone can see) as it was 12.8 Billion years ago, or less than a Billion years after the Big Bang. If only there were some other force than gravity. well my midi-chlorian count is north of 15,000. There are: electromagnetic, strong and weak interaction. So rather than ‘astronomy’ this seems to be a mystery of language and meaning. Exploded has a rather specific meaning. What about the Big Bang Bang? Or the Chitty Chitty Bang Bang? Look up “recurring nova” A white dwarf accreting hydrogen from a companion will periodically experience a thermonuclear runaway. Dark matter, dark energy and inflation are all convenient explanations for ” we don’t really know “. Could be right, but we are really guessing and these ideas should not be taken as facts but theories, at best. Can’t find any dark matter so far. Why would expansion suddenly accelerate 7 bya? What caused inflation to happen just enough, fractions of a second?, to make the big bang numbers work? We are missing something here and buying into these loosey goosey theories takes our eye off the ball. Keep looking. “Exact” same location? Surely stars and galaxies would have moved a little in 40 years? How do they know it’s not two nearby stars going “Boomie” one after the other? Maybe even the second one influenced by the first one? I’d also like their evidence for their “exact” location statement. Wait a sec. Didn’t the rebels have to blow up the Death Star twice?? Ahh, that’s it.